Shredder has stolen the Statue of Liberty! You and up to 3 friends are tasked with defeating Shredder and getting it back. The only catch? Shredder has thrown you back in time! Beat up Shredder's goons through several different eras, from prehistoric times to a space station in the year 2100! Cheesy commercial voice aside, Turtles in Time is a classic beat-em-up for up to 4 players to play as their favorite turtles: Leonardo, Michelangelo, Donatello, and Raphael. It's 10x more fun with friends, so grab a couple for a fun-filled night. 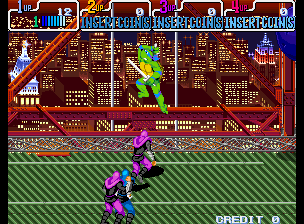 I played this game with my brothers CONSTANTLY as a kid, the same satisfaction of defeating Shredder several times all the way. I'd definitely recommend this game. I gave it a 4/5 because some people might feel it get repetitive, with more button-mashing and less combos. Now you can add videos, screenshots, or other images (cover scans, disc scans, etc.) 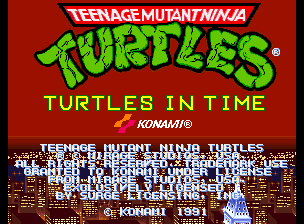 for Teenage Mutant Ninja Turtles - Turtles in Time (4 Players ver ADA) to Emuparadise. Do it now!